I further discussed that the phone has become our “everything.” Many respond to the phone ping/vibration as if all is urgent with immediate response time. 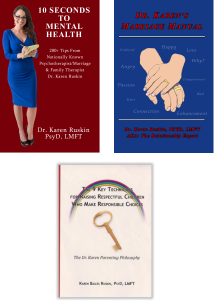 In my counseling private practice I have seen more and more families coming in for therapy because of the stress related to the family relationship dynamics instigated by technology. For example, kids are getting emotionally upset when they do not have immediate access to their phone whether because it is broken or taken away from their parent. In some families, parents are concerned that their teens have a phone addiction, whereas in other families kids are accusing their parents of being text addicts inducing family conflict. During this interview I stated that there are are people who are “hooked on phone” and deny this actuality. This has become a serious problem. It’s not just young kids, teens or millennials, it’s also older adults. Answer: create phone boundaries! The relationship one has with one’s phone needs to be healthy. The first step toward a healthy relationship with one’s technological devices is to develop clear rules/guidelines for when to use it and when not to. 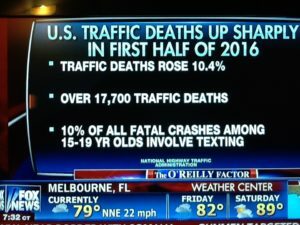 Bill provided his viewers with the current statistics regarding the dangerous of cell phone use while driving. Whether walking or driving there produces a lack of awareness of what’s going on around us when one’s face is in one’s phone. 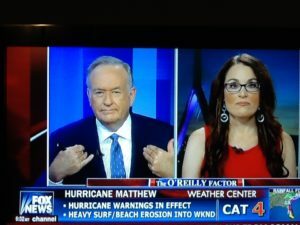 If you missed my interview on The O’Reilly Factor, I invite you to watch it on demand. As the entire program is available via this link, if you wish to watch this segment only, scroll to the 20 minute mark to watch: Addicted To Texting. Next post: Trump Vs Clinton – Do The Issues Matter?